Miles Morales makes the most of his Hollywood moment. 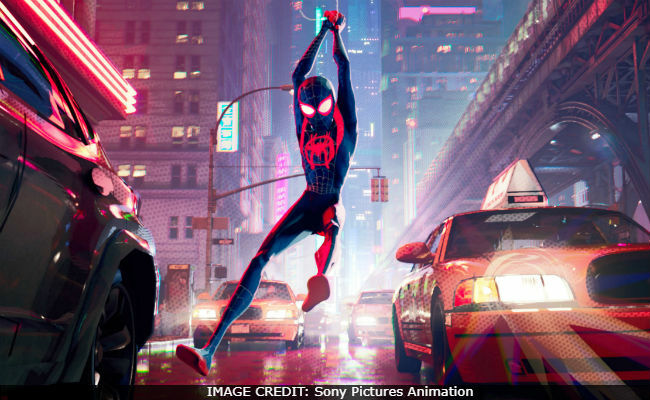 Spider-Man: Into The Spider-Verse, the multidimensional mind-trip from Sony Pictures Animation, feels less like the seventh Spider-Man movie to hit the big screen (we’re not counting Venom) and more like a one-of-a-kind, wall-crawling experience. It deserves top ranking among Spider-Man’s greatest cinematic achievements, live-action or otherwise. This movie, and particularly this universe, is the start of something special for Sony, which needed Marvel Studios and an Avengers membership card to save its franchise. But it may now be on the cusp of a new kind of sequel-spawning, connected superhero universe where Marvel Studios’ help isn’t needed. Imagine that. Spider-Verse combines two of the most recent and popular story lines from the comics: one, the idea that there are multiple dimensions featuring all different types of Spider-Mans, and two, the debut of the half Puerto Rican, half African-American webslinger, Miles Morales. The movie also includes classic foes, many with a new twist – including the Kingpin, who is the literal big bad in this film. Miles (voiced by Shameik Moore) is the star of the movie, but many other spider-people make an appearance because of a dimensional breach. They include an older, unshaven and slightly out of shape Peter Parker (Jake Johnson); one of Marvel Comics’ coolest new characters, Spider-Gwen (Hailee Steinfeld); Spider-Man Noir (who should be called Spider-Batman and is voiced by Nicolas Cage); and the might-as-well-be Porky Pig in a Spider-Man suit, Spider-Ham (John Mulaney). They are all there to guide Miles on his journey of realization that he, too, can be Spider-Man. And while that’s a lot of super folks swinging around New York City, Miles gets his own time to shine and proves himself worthy of his superhero name (and still rocks one of the coolest superhero suits in comics). We also get quick but heartfelt glimpses of Miles’ life without a mask. It’s moments like these that mean a lot to the legion of diverse fans that writer Brian Michael Bendis and artist Sara Pichelli had in mind when they created the character – a biracial kid taking up a legendary superhero mantle. It’s touching to see Miles roll his eyes at his African-American father, Jefferson (Brian Tyree Henry), who isn’t afraid to get on a bullhorn and profess the love he has for his baby boy. Miles also tries to dodge besos from his Puerto Rican mother, Rio (Luna Lauren Velez), who lectures him in English and Spanish. We see Miles’s personal life parallel Peter Parker’s when he comes into his powers at the same time he discovers his uncle Aaron (Mahershala Ali) is a supervillain working for the Kingpin. You can’t be Spider-Man without uncle drama, after all. Brooklyn is definitely in the house in this movie, and Miles’ biracial existence plays a big part in its authenticity. A little of the Notorious B.I.G. in the soundtrack doesn’t hurt either. These subtle nods to the cultures in Miles’ life are genuinely heartwarming and the kind of thing you don’t see in your standard superhero film. It’s part of what makes Spider-Verse such a unique experience. But this is still a superhero movie at the end of the day. Miles Morales may be a comic book cultural icon now, but there’s only so much time Spider-Verse can spend showing how woke it is. So, if you think Miles is going to be scowling at unseasoned potato salad and screaming “yo soy Boricua pa’que tu lo sepas” anytime someone asks if he’s Dominican (that happens a lot when you’re half African-American/half Puerto Rican), well, there’s no time for that. There’s a new universe to establish. Sony is on a roll right now and has not one but two franchises that could reignite its ability to print bucks at the box office sans Marvel Studios. Venom has used its buzz factor to rake in almost $850 million in ticket sales worldwide. Spider-Verse is more of the same, but it’s a different kind of movie experience for this franchise – one that feels bold, fresh and bravely experimental. The most compelling thing about this movie is the loud message that anyone, no matter who you are or where you come from, can be Spider-Man. Can be a hero. Can be an inspiration.